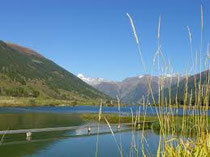 The Goms valley with its untouched mountain scenery offers a big range of exciting summer activities for everyone. In Goms the enthusiastic walker will find more than 700 km of waymarked trails over mountains, glaciers and high alpine passes. And for those who favour a less strenuous approach, there are gentler valley trails. In fact there's everything that the keen walker could desire. In addition to the three classic routes – the "Gommer Höhenweg", the "Gommer Waldweg" and the "Rottenweg" – there is an extensive network of trails that lead into this magnificent mountain world. The varied mountain bike trails lead past crystal clear mountain lakes, natural forests, lush meadows and provide appropriate challenges for each level of difficulty. Do you take your sticks on holiday with you? If so, you can bid the asphalt adieu in Goms. 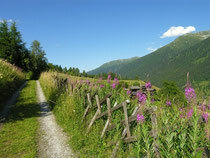 In Goms you will be walking on natural paths that are kind to your joints. Specially marked Nordic walking paths offer something for all fitness levels. Outstanding instructors will help you with your technique. Training weeks and weekends provide an ideal opportunity to practise this sport with like-minded individuals. Healthy outdoor sport in unspoiled nature – that's Nordic walking in Goms. A trip on an inflatable raft on the young Rhone promises lots of fun and a unique experience of nature. The route runs from Oberwald to Gluringen and offers some calm stretches as well as others in which everyone will have to pull their weight. Go for a swim in the deliciously cool Geschinersee or just lie down and relax on the lawn. Or why not go for a stroll along the shore on where you can also push a pram. Sooner or later everybody gets together at the playground or the barbecue area. There is a skater park nearby, where tricks on blades or skates can be executed on half pipes an other tools. It's full steam ahead past flower-strewn meadows, over precipitous viaducts, through narrow tunnels and across the Steffenbach Bridge, which is dismantled during the winter to protect it from avalanches. 9-hole golf course "Source du Rhone"
What's your handicap at 1,350 metres above sea level? On what is surely Switzerland's most beautiful and longest 9-hole course you can find out if your swing is really as good as you think. The «Source du Rhône» golf course in Obergesteln makes an immediate impression with its manicured fairways and greens, its natural beauty and its fantastic views.